A beautiful, classic and luxurious inn at Okemo Mountain Resort, with a full range of fully-furnished units – from traditional inn rooms, all the way up to three-bedroom penthouse suites. 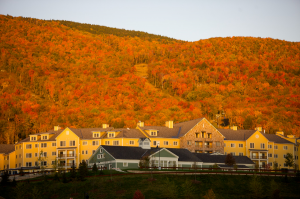 Nestled at the base of Jackson Gore Peak, the Inn has spectacular views of Okemo Mountain and the Okemo Valley. Simply walk outside and enjoy the Green Mountains of Vermont at your doorstep. Some rooms come with a water jet tub and an entertainment center with cable TV, a CD and DVD player, and surround sound. All rooms are accessed by elevators. 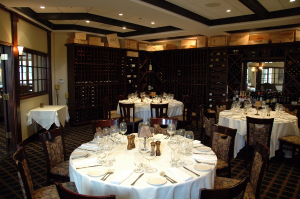 Underground parking garage (heated for wintertime use) and valet parking for overnight guests. Inn guests have full access to the Spring House fitness center and exercise pool, large heated indoor-outdoor pool, inside and outside hot tubs, children’s pool, sauna, steam room, locker/shower rooms and massage services. The Ice House offers covered tennis courts during the summer and ice skating in the winter. Uniquely designed packages may include breakfast, lunch and dinner. Ask about our other condominium packages and group activities. Resort Activities: Adventure Zone (zip line, mountain coaster), Dining, cycling, hiking, tennis,weekly concerts (summertime only), golfing, self guided driving tours, outlet shopping (within 45 minutes), antiquing, regional festivals and historic sites, canoeing/kayaking and theatre. In winter, enjoy skiing and snowboarding, cross country skiing, snowshoeing and ice skating or simply relax by a roaring fire. Rising above the village of Ludlow, in south-central Vermont, Okemo Mountain Resort is a four-season playground that built its reputation for quality and superior guest service. 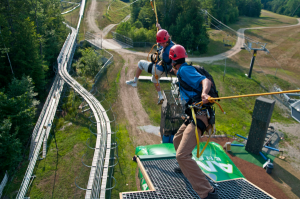 Okemo Mountain Resort is the outdoor enthusiast’s dream come true. The wintertime brings exceptional Vermont skiing and snowboarding on snow that is ranked in the top 3 in the East year after year by SKI Magazine. In the summertime, our brand-new Adventure Zone includes attractions to keep the whole family busy and the new HaulBack Challenge Course is a self-guided aerial journey with 25 elements and multiple loops that challenge your balance and strength. Add to that our two championship golf courses and you have a recipe for quality family fun! Year round! 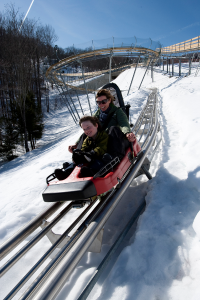 Okemo and the surrounding area offer your group an endless selection of activities, attractions and lodging for all ages. Contact us for details and information to plan your tour to Okemo and Vermont.